I've been a big fan of Canon's S series compact cameras. Great optics, good performance, and lots of features in a compact body. 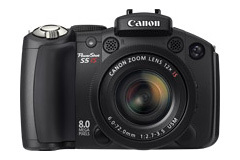 Canon Europe has announced the latest version of this popular super zoom, the PowerShot S5 IS. Basic specs include a 12X optically stabilized zoom lens, 8 megapixel CCD image sensor, DIGIC III processor, 2.5" vari-angle LCD monitor, flash hotshoe, ISO range of 80-1600, red eye correction in playback, long play movies with stereo sound, and a good software bundle. You can capture in burst mode at 1.5 fps until the card fills up. And road warriors will appreciate that the S5 uses AA batteries. This camera presents lots of options for flash photography. You can mount Canon EX flashes in the hot shoe, apply flash exposure compensation, and even use second curtain sync. The 12X USM optical zoom is a 36-432mm equivalent with one aspherical and one UD element with f/2.7 - f/3.5 maximum aperture. Shutter speed range was 15-1/3200 of a second. This is a lot of camera squeezed into a handsome, compact body. I love the large rotating LCD screen and the hot shoe. Very nice. Canon's optical stabilization is very effective. And to have 8 megapixels with a 12X optical zoom is quite a luxury indeed. My only complaint, as you might guess, is that there's no Raw format option, which I don't think is unreasonable for a camera of this caliber. But that nit aside, this is an impressive, versatile, and powerful picture taker for those who need the extra reach of a 12X zoom lens. Definitely worth a closer look. Have you ever played around with the lighting equipment you can get at a regular hardware store? You can create some decent (though low-powered) schemes that are useful for shooting objects and even people... if they promise to hold still. 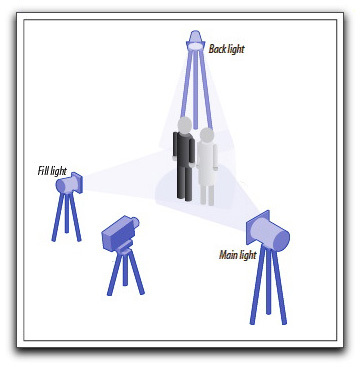 Here's a free downloadable PDF titled, DIY Studio Lighting Set Up (100 kb). It's fun; it has some useful info, and you can share it with your friends. 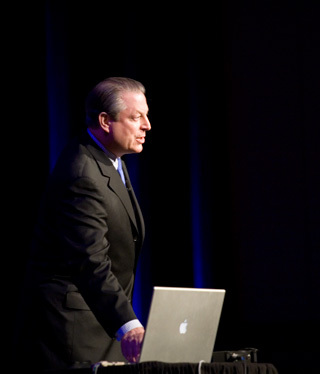 Al Gore spoke at the CRE8 Conference on Wednesday, essentially giving a live performance of his compelling Inconvenient Truth movie. If you haven't seen the film, I recommend it. The presentation is both scientifically gripping as it is humanly compassionate. And yes, there is a sense of urgency. Tipper Gore is an accomplished photographer who contributed images to Al's presentation. I was once again reminded of the power of photography when photos resonate with head and heart simultaneously. From Al's opening picture of the earth from space, to Tipper's devastation shots from New Orleans, to the beautiful glaciers in Greenland, photography was a vital ingredient in Gore's argument. Who knows... you may someday have the opportunity to impact the world with one of your pictures. One of the fun side benefits to establishing The Digital Story Flickr Group is that we now have a discussion forum too. Here we can ask photo questions, suggest podcast topics, point out interesting things to shoot, and get to know each other better. So even if you're not ready yet to share your images on the Member Photo Gallery page, you can still participate in the discussion. All you have to do is sign up for a free Flickr account, then join our public group. You'll see "Discuss" right there in the middle of the page. Jump in and join the conversation. If you'd like more information about posting a photo to TDS, read how to submit. So, whether you're sharing your photos or your thoughts, we're happy to have you as part of our virtual camera club. How to Publish on the TDS "Members Photo Gallery"
The Digital Story now has a Member Photo Gallery where you can post up to 5 pictures a week to share and discuss with other virtual camera club members. Participation is simple. We've established a Flickr Public Group to manage the submissions. Once you post an image to the Public Group, it appears on the TDS Member Photo Gallery within 24 hours. It's that easy. Here are the detailed steps. Establish a free Flickr account (if you don't have one already). Join The Digital Story Public Group. Look for the "join" link on the Public Group page. Go back to your flicker home page (by clicking on the "Home" link in the upper left corner). Click on "Upload Photos" link and add your images. Choose one of the pictures that you've just uploaded that you want to add to The Digital Story Member Gallery, and click on it. This will open it up on a new page where you can add tags and a caption. You can even change the title if you want. 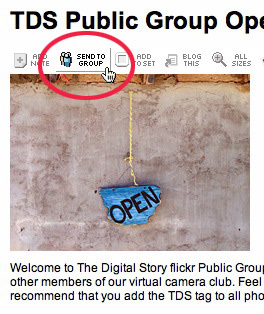 Once you have everything in order, click on the "Send to Group" link right above the photo. You will see the link to The Digital Story in the popup menu. Select it and you're done! Within 24 hours, your picture will appear on the Member Photo Gallery page. We'll also use the Flickr Public Group to communicate with each other, such as sending out special notices and alerts. Visit the TDS Member Photo Gallery to see what your peers are publishing. Feel free to comment on any of the photos by clicking on them (you need to be a Flickr member to comment on these photos). I'll continue to evolve this page and its functionality. So stay tuned... and start sharing your photos today! If you have a photo collection on your iPod that you'd like to move to a different computer (Mac or PC), iPod Access Photo puts you back in control. You've probably realized that the iPod stores photos in ithmb files. These files contain all the photo data for your iPod to display but can not be read by regular photo programs. iPod Access Photo solves this problem by allowing you to select individual photos and albums to be moved back onto your computer or an external hard drive. You can try iPod Access Photo, and if you like it, you can buy it for $12.99 US. Findley Designs, the maker of this software, also offers iPod Access for Mac OS X that enables you to copy your music and videos off your iPod. Yesterday I talked about how sharp the Canon 70-200mm f/4 L zoom is. This is one of my favorite lenses for portrait work. The only problem is, sometimes I don't want razor sharp optics for certain subjects. A little diffusion can go a long way toward making a client happy. There are lots of great softening filters out there, often with a hefty price tag. But you can make your own portrait filter for just a few dollars, or even less, if you can wrangle an old pair of pantyhose -- or better yet, knee-highs (you can use them just as is). Featured here are Lenobis Elite SOFFIO DORATO Ultra Sheer TANNING Pantyhose. Tan pantyhose will produce a warming effect too, so experiment to get the color temperature you like best. This tip adapted from Digital Photography Hacks by Derrick Story. There are very few lenses that I would label as "flawless," but the Canon 70-200mm f/4 L is one of them. For about $575 US, you can get a solidly built "L" zoom that is tack sharp at all focal lengths (center and edge sharpness), even on the most demanding sensors, such as the full-size Canon 5D. I know many pros prefer the f/2.8 version of this lens because of its light gathering power, but that lens costs twice as much and is much heavier and larger. Photographers on the go who want the best image quality possible, and can live with f/4, will be thrilled with the lighter version. Last year, Canon also released an Image Stabilized version of this lens for about twice as much. Not only do you get the same great optical performance as the original f/4, but you get up to 4-stops of stabilization. You can find out more by reading this review on SLRGear.com. This is really the only way to improve upon the original. Either way, depending on your budget, the Canon 70-200mm f/4 is one of the most pleasurable lenses you'll every shoot with. And if that isn't good enough, the pictures it produces are outstanding. Keep your eye on the used market too. A lot of the non-stabilized lenses might be showing up as fans upgrade to the IS version. Thinking about getting a serious fine art printer? I've just posted an interview with Rick LePage on Inside Aperture where we discuss the latest offerings from Epson, Canon, and HP. Rick has been testing printers in his "editor at large" role for Macworld Magazine. He has some great insights about the Epson 3800, HP B9180, and Canon's elusive 9500. If you're in the market for a new printer, you should listen to this show. 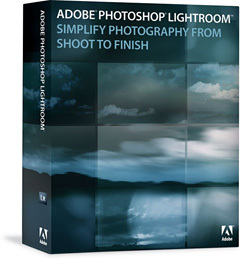 The Lightroom "early adopter" discount ends on April 30. For customers in the US, that means the price jumps from $199 to $299 on May 1. The early adopter program in Canada and UK also ends today, with the UK price increasing from £125 to £175 (ex VAT). Lightroom is available for both Mac and Windows, and is an outstanding photo manager that provides an easy workflow from upload to output. It's a bargin at $199, so if you've been thinking about making the move, go over to the Adobe Store before the offer ends.